Fire marshals determined that the fire was accidental/electrical, due to an extension cord. A voice message on The Odeon restaurant's phone indicates that, as a result of the fire, the eatery will remain closed until Tuesday. 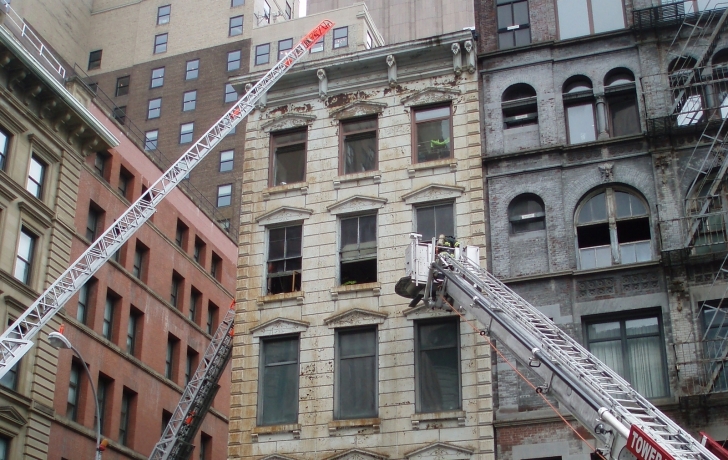 Two people sustained minor injuries Friday morning in a fire that broke out on the fourth floor of 145 West Broadway, a five-story loft building housing The Odeon restaurant. Water descending from the ceiling forced management to close the restaurant, at least over the weekend. It also caused unknown damage to the apartments above. Artist John Willenbecher, a 45-year resident of the building, lives in the loft where the fire began. Reached by email, Willenbecher said he was in the process of trying to save water-damaged belongings and could not respond to questions. "I'm a wreck but okay," he wrote. About 12 FDNY units, including 60 firefighters, responded to the blaze, which was extinguished at 11:30 a.m., about half an hour after it was reported, according to a Fire Department spokeswoman. Two people sustained minor injuries––one firefighter, who was taken to NewYork Presbyterian-Lower Manhattan Hospital, and a civilian, who refused medical attention, the spokeswoman said. The spokeswoman did not give a cause of the fire. "We were ready for service, having our breakfast and the neighbor came down and alerted us that there was a fire in the building," said Aaron Crowley, The Odeon's general manager. "For the safety of everyone, we evacuate our employees. So we evacuated the building and watched, like the rest of the neighborhood, from across the street." As Crowley spoke, men stood on a ladder, draining water from a light fixture on the ceiling and mopping puddles of water from the floor. The air was heavy with the smell of smoke.